The once blue zone city Buenos Aires has been infested by tiberium. A battle between NOD and GDI left as result a devastated area. At the end of the battle, NOD tested its new tiberium vein detonation super weapon, which leaves the city in ruins. This map is very similar to the KW version (with some new visual details). With this map I tried to recreate "real-life" Sarajevo (set in an urban red zone). A river runs through the city and separating the map on two parts (north, south). On the north is an abandoned Nod base, and on the south is an abandoned GDI base. They are next to the player's starting positions. There is plenty of resources (four green tiberian fields, two blue fields, and four tib spikes). Enjoy the map! This map is a blue zone city. It has symmetrical start locations and tiberium fields, over an asymmetrical city layout. There are 4 green tiberium fields, 4 blue tiberium fields, 4 tiberium spikes, and a lot of buildings.. It is a very detailed map: +5600 objects and +3300 waypoints (roads, sidewalks, etc.) and there are birds and trains moving. There is a lot of strategy involved in this map. Try to get a blue tiberium field for you as soon as you can. Be warned of Scrin motherships; they can rule on this map. This map pack is a set of varied environment areas; from blue zone to red zone. Most of the maps are symmetrical and well balanced. Some of them have accelerated tiberium grow rate, and all of them have expansion areas to harvest green or blue tiberium. There is enough to provide an intense gameplay. All base areas have at least three sides to be attacked, and some spots to deploy reinforcements. All the maps can be played in skirmish, network and online. Description: This map is a blue zone map which has a dam between the mountains. This map is intend to be played in teams, 2 vs 2.. There are two places to expand that has blue tiberium fields which regenerates fast. You should go for those places as fast as you can. 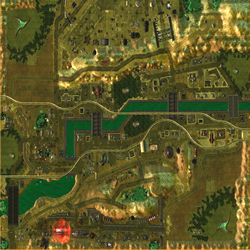 Description: There is an Ion Cannon and a Nuclear Silo to be captured in this map. Each player has 3 tiberium spikes near the base, and there are 4 places to expand. There is also a subway station in the center which provides strategical transport for your infantery.. This map can be played on 2 vs 2 or free for all. There is also a Juggernout and an Avatar husk to be captured, but you should go fast for them because they will disapper after some time. Description: This map has a stadium in the center, and a functional monorail circuit (it has 4 trains moving). The tiberium inside the stadium regenerated fast, and there are 8 tiberium spikes in it. Each player starts outside the stadium with a blue tiberium field near, and a tibeirum spike. Description: This map is ambiented on an asteroid night surface. It is intend for slow computers to run an 8 player map fast. It is very simple with great gameplay. The blue tiberium regenerates fast, and there are many tiberium spikes to capture. This map is to be played on 4 vs 4 or 3 vs 3 leaving the corner start locations empty. Description: This map is ambiented on an asteroid sun surface. It has improved texture work and post-effects than my previous map (Asteroid). The blue tiberium regenerates fast, and there are many tiberium spikes to capture. Description: This map is a blue zone area. There is one tiberium field for each player, and one blue tiberium field to build an expansion base. There is also a big blue tiberium field on the center of the map, that is not easily accessible. There are 4 tiberium spikes and some veterancy crates around the map. Description: This map is intend to be played 2 vs 2. Each team has 2 green tiberium fields, 1 blue tiberium field (which regenerates fast) and 2 tiberium spikes. There are 2 gun cannons for each team, and some tiberium spikes on the center of the map. Description: This map is a yellow zone desert. It has intense sunrays. There are five tiberium spikes on the center of the map, which are protected by gun cannons. There are 4 blue tiberium fields to expand your base. Description: This map is a red zone space platform. It has 2 tiberium spikes on each player platform. There is an asteroid on the center which has unlimited tiberium and eight tiberium silos. This map pack is a set of varied environment areas; from blue zone to red zone. Most of the maps are symmetrical and well balanced. Some of them have accelerated tiberium grow rate, and all of them have civilian buildings to capture and expansion areas to harvest green or blue tiberium. There isn't unlimited tiberium, however there is enough to provide an intense game play. All base areas have at least three sides to be attacked, and some spots to deploy reinforcements. Description: This map is ambiented on a yellow zone desert. Two forts are located on each side of the map. They are protected with bunkers and gun towers. There are five tiberium spikes, and blue tiberium to harvest out of the forts. The map is symmetrical. Description: This map is ambiented on a red zone area. It is divided by a lake and a river. It has a dam in the center. There are 8 tiberium spikes around the map, and some control points and gun turrets. Each player has its own green tiberium, and there are two places to harvest blue tiberium near the center of the map. There are 3 bridges to cross the river, and there is the dam also. It is indestructible, narrow, and defended by gun towers. Description: A blue zone, almost vertical symmetrical map. There are mountains on the left, and the ocean on the right. There is a lot of grass, and some farms and a factory. A monorail crosses the map. There are 4 tiberium spikes, and some blue tiberium on the sides of the map. This map is intended to play on teams, locating "Upper Team" vs "Bottom Team". Description: This map is a stadium. Each player starts with a blue tiberium field, and there is one green tiberium field in the center that regenerates fast. There are 6 tiberium spikes. The map is symmetrical. Description: This map is ambiented on a desolated area of the moon. Six outposts are fighting for the tiberium; they are protected by bunkers and have a tiberium spike. Some blue tiberium is spotted at the center, and a missile launch center with an EMP Control Center. Some spaceships have left some veterancy crates around the map. The map is symmetrical, and can be played in teams as well as free for all. Description: This map is a blue zone port area; it has docks on the edges, and small towns on the center. There are many veterancy crates around the map and some tiberium spikes on combat areas. The map is symmetrical and is intend to play 4 vs 4, or 4 teams of 2 players. This map features more than 4000 (four thousand!) road pieces, more than 5500 (five thousand five hundred!!) trees, houses, cars, road signs, fences, garbage, garbage cans and 24000000 (twentyfour million!!!) square feet of hand textured and blended terrain. It took six weeks from start to finish, reviewing all multiplayer blue zone maps from Tiberium Wars and some other works to get the look right. In the process I crushed 500 Ais, got crushed by a dozend online gamers, got encouragement and support by fellow C&C online players who would just drop by and offer a comment. 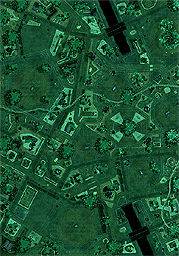 Tiberium Erosion is a asymmetrical 1 vs. 1 map taken place somewhere deep in a German Redzone, where Tiberium has eroded an entire city to ruin, leaving but only a massive crater of Tiberium; the German city has now long been abandoned from all hope. 6th Place in OMC4. Forsaken Sands Of Tiberium is a 4 player map, It is just about completely asymmetrical, around the map there is a EMP Tech Building, damaged garrison able buildings, Tiberium spikes, and a typical amount of Tiberium for each player. This map takes place somewhere in Brazil. The Environment is abnormally semi-desert jungle with steep hills or mountains bursting out of the sands; this therefore looks as if there are islands of jungle within Seas Of Sand. 5th Place in OMC4.